We’ve already covered several NB-IoT (and/or LTE Cat M1) Arduino shields with products like RAK Wireless WisLTE, Sixfab Arduino NB-IoT shield, or AIS NB-IoT shield, which all happen to come with Quectel modules. 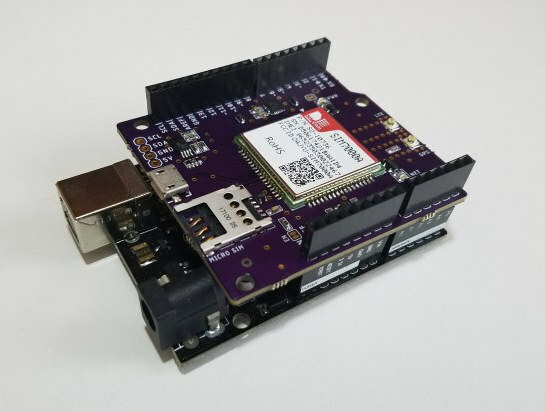 A young self-taught engineer has decided to make his own Arduino eMTC/NB-IoT shield, but based on a SIMCom SIM7000-series module instead of a Quectel one found in the other aforementioned products. EAGLE schematics and PCB layout, documentation, and software example have already been pushed to Github. 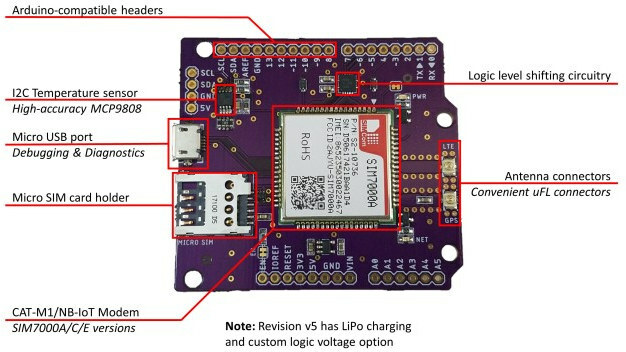 The board launched on Indiegogo last month with the “Arrow Certified Technology” campaign aiming to raise at least $7,000, but since it’s a flexible funding campaign, mass production will happen regardless of the success of the crowdfunding effort. The $79 pledge for the shield may look expensive at first, but considering it ships with LTE & GNSS antennas, a stacking female header kit, a Hologram global IoT SIM Card with $40 of credit, price does not look too bad after all. Shipping fee does not appear to be included, and price is not mentioned, so you may have to pay an extra shipping fee when actual shipping is due around June 2018. Timothy also uploaded some video tutorials to YouTube such as the Real-Time LTE Arduino GPS Tracker tutorial below.